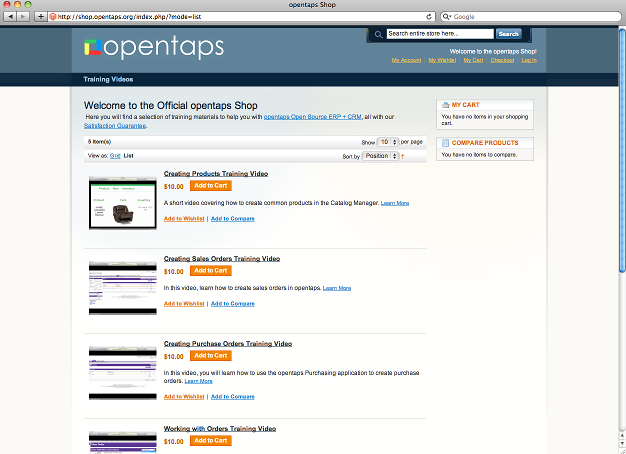 Magento and the opentaps Online Video Store — Open Source Strategies, Inc. Fascinating to read your opinions on other software. Thank you for sharing. I\’ve been using Magento since before their 1.0 production release a few years ago. It\’s great for simple carts. Love the Magento Connect for installing 3rd party add-ons. I use the WYSIWYG one for all of my clients. Also like the way themes can be extended to easily offer different seasonal looks without copying over a ton of repetitive code. The OO framework is great, very similar to java. But as uncompiled php, it can run a bit slow. Hi Si. Cool video demo. I had no idea this integration existed. Very excited about the possibility of ease of use and design of frontend through Magento with robust CRM/ERP backend of Opentaps. On another note, I found out on a new Magento install yesterday that the latest versions come w/ WYSIWYG editor and don’t need the plugin. Congratulations on the continued growth of Opentaps.